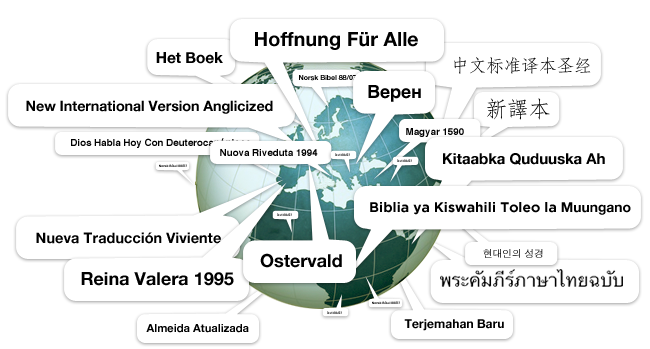 No matter where you live, no matter what language you prefer, we want to help you engage with the Bible every day. You may know that thanks to YouVersion’s generous Bible publishing partners, the Bible App™ already offers more than 600 versions of the Bible in more than 375 languages. What you may not know is that the Bible App has been installed and used in every country on earth, and that about 40% of new installs take place outside North America. Of course, the Bible App is more than the Bible. We want your entire experience exploring God’s Word to be fulfilling. But we couldn’t do that without help. More than 350 volunteers all over the world passionately devote themselves to ensuring you enjoy the Bible. They share their talents and time translating basics like screens, menus, and buttons into your language, as well as all of the Bible App tools you know and love, like Reading Plans, Notes, and more. That’s why today—right now—you can use the Bible App for iOS (Apple iPad, iPhone, and iPod touch) in any of 33 languages. The Bible App for Android offers 40. And bible.com has 42. On iOS or Android, the Bible App defaults to your device’s language, or you can change it in the app Settings. At bible.com, simply select your favorite language at the bottom right. The languages we’ve most recently rolled out include Malay, Catalan, Albanian, Portuguese (Portugal), and even Arabic! 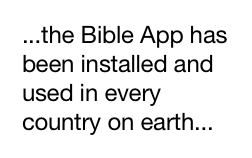 The Bible App has been installed more than 100 million times so far. Each one of those installs—wherever it happens in the world—represents a story, a person, a life connected to God and to His Word. You can be a part of that, too, every time you share the Bible App with someone who speaks a language other than English. It starts with 100 million.